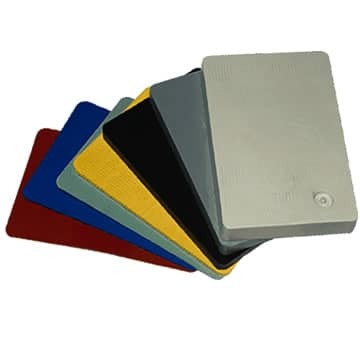 Product Description: Plastic Shims are used for packing under precast concrete panels or tilt-up panels, effectively levelling the high load objects and achieving alignment with a non-skid surface. These plastic shims are manufactured from premium quality materials and have undergone extensive testing to ensure they meet Australian standards. Ribbed patterning on the surface of each shim helps to prevent slippage during on-site panel alignment operations. Size of each Full Shim is 100mm x 150mm and thickness ranges from 1mm to 20mm. Half and horseshoe shapes (ideal for placement around starter bars, locating fixtures etc.) are also available.